It’s funny that Megadeth are still one of those bands that I get excited about when I know there is a new release on the horizon. The rest of the big four as well as any of the other significant others of that ilk bring the same. You know that layer...the ones that probably should have been a part of the top tier but for whatever stupid reason where not included. Anyways, rant aside, the simple fact is that I’m always eager to hear something new from Dave Mustaine and whatever his current line-up may be. Now, it’s been an interesting ride since the generally poorly received Super Collider hit the shelves in 2013. But at the end of 2014, guitarist Chris Broderick and drummer Shaun Drover both made a shock exit from the group, leaving Mustaine and long standing 2IC bassist David Ellefson once again the sole remaining members of the group. It’s not an unusual position for the Dave’s really as history shows they’ve been there done that before. 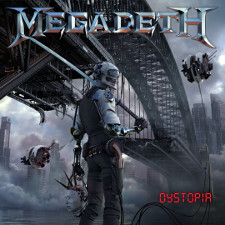 Soon enough, Megadeth recruited Brazilian guitarist Kiko Loureiro (Angra) and hired the skills of Lamb of God drummer Chris Adler and the band were back in the studio recording album number 15, titled Dystopia. From the moment the guitars truly kick start the opening cut, “The Threat Is Real”, it’s clear that Megadeth are back on point. There’s more attitude and more focus in this one song than the entire Super Collider album. But to put Dystopia into perspective, it continues with the same kind of vibe found on 2007’s United Abominations and 2009’s Endgame. What I like about this latest effort from Mustaine and Co. is the fact that it’s reasonably well balanced of aggression and melody that’s chock full of simple yet infectious riffs and blistering lead breaks. Sure, the title track of this album has the skeletal hallmarks of fan favourite “Hangar 18” all over it, but that ain’t a bad thing. The track itself is one of the strongest on offer and really should sit well with fans that are accepting of the fact that Megadeth will never, ever do another Peace Sells... But Who’s Buying? or another Rust in Peace. With eleven tracks at just shy of 47 minutes, Dystopia isn’t without its flaws. Aside from the instrumental Conquer or Die!, the second half falls short of ideas and starts to sound a little samey when a number of songs tend to lean too heavily on a typical alternate picked, single note pattern. It becomes somewhat of a crutch at times which takes the shine off the album a bit. The very rock tempo’ed “The Emperor” could sit anywhere within the realms of the band’s Countdown to Extinction era and as catchy as the chorus is, it still feels like a song that I could do without to be honest. If there’s one thing that Megadeth have managed to pull off more than a few times over the course of their almost 33 year career, it’s a solid closing track. Take a look at the evidence – “Mechanix” (from Killing is my Business...and Business is Good), “My Last Words” (from Peace Sells...), “Hook in Mouth” (from So Far, So Good... So What! ), “Rust in Peace...Polaris” (from Rust in Peace), “Victory” (from 1994’s Youthanasia), “Burnt Ice” (from 2007’s United Abominations). Ok, so the evidence is a little thing towards the latter part of Megadeth’s career, but the almost two and a half minute “Foreign Policy” is easily one of the more simplistically interesting and catchy closers they’ve produced in a few years. It is without question that Dystopia is miles above the absolute abomination that is Super Collider, an album that sits only marginally above Risk in my books. With a comparison like that, to be fair, that statement really doesn’t indicate any kind of major achievement. For anyone who isn’t a fan of anything that Megadeth has done in the last decade, this album isn’t for you, either. In fact, you and Megadeth probably need to break up, proper like. But if anything Dave Mustaine and his various cohorts have released since 2004’s The System Has Failed has ticked your fancy, then Dystopia will be right up your alley too. Whilst it’s not remarkable, and as someone who thought United Abominations has been the band’s best effort since “reforming” after Mustaine’s infamous hand incident, this one goes alright for sure.